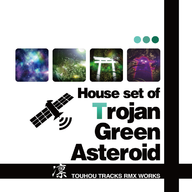 House set of "Trojan Green Asteroid"
House set of "Trojan Green Asteroid" — музыкальный додзин-альбом, созданный Kuroneko Lounge и опубликованный 2013-11-24. Это хаус-сет с аранжировками из Trojan Green Asteroid. Альтернативно он может называться "Trojan set", как написано в треках. House set of "Mountain of Faith"
House set of "Undefined Fantastic Object" • House set of "the Embodiment of Scarlet Devil" • House set of "Imperishable Night"
House set of "Retrospective 53 minutes" • House set of "Perfect Cherry Blossom" • House set of "Subterranean Animism" • House set of Touhou Project mix set "Gensoukyo" • House set of Touhou Project mix set "BossRush" • House set of "Phantasmagoria of Flower View"
House set of "Ten Desires" • House set of "Magical Astronomy"
House set of "Mountain of Faith" ReEdit • House set of "Trojan Green Asteroid"
House set of "Touhou Project" Rare Tracks • House set of "Double Dealing Character" • House set of "Neo​-​traditionalism of Japan"
House set of "Legacy of Lunatic Kingdom"
Эта страница в последний раз была отредактирована 2 июля 2016 в 18:57.